The book I wish my own mother had had when I was struggling and she felt so powerless. It states the problems but is full of solutions, games, projects, resources and cheat sheets for when your kids ask you sticky questions… and you need solid answers. The negative messages our kids will hear from the media and society will be loud. The positive messages we give them as their parents need to be even LOUDER! These are the tools you need to empower your kids to grow up with the self-confidence and self-esteem they deserve. 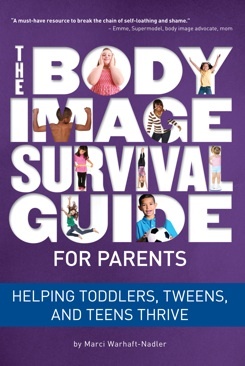 Subscribe to comments with RSS	or TrackBack to 'The Body Image Survival Guide for Parents:Helping Toddlers, Tweens and Teens Thrive'. I really want to get a copy of your book. I’m so glad you wrote it and I can’t wait to read it!